IDN is a short for Internationalized Domain Name and is used for domain names that include at least one character which isn’t in the normal alphabet (A-Z), isn’t a number (0-9) and isn’t a hyphen (-). IDN allows you to use accented letters. Starting June 11, 2013, Web Solutions offer the option to register IDN domain names with a .BE extension. There is no Sunrise phase for IDNs. That means that everybody can claim his .BE IDN from today, under the same conditions as a regular .BE domain. 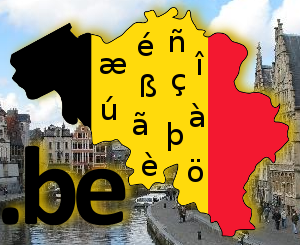 Belgium has three official languages – Dutch, French and German, and the introduction of .BE IDN domains is not restricted to accent characters from these three languages, but is also including special characters from other European languages like Swedish, Danish and Finnish. *Important note regarding the use of ß: not all browsers support this character in the same way. Applicants who want to register a domain name with an ß are also recommended to register a version with “ss”.